SkyBlade Fans High Volume Low Speed (HVLS) Fans are specially designed fans with leading edge STOL technology. STOL series 12-24’ fans deliver top efficiency to heating and cooling systems by reducing their run time, cycles and improving overall comfort. Short Take Off & Landing (STOL) technology created our airfoil design allowing us to accomplish moving more air with less energy consumption. 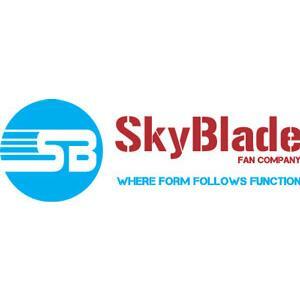 With energy efficiency and air movement in mind SkyBlade Fans reduce the need for heating in the cold months through Destratification of the area and increasing air velocity in warm months to create an evaporative effect on the skin and assist air or sometimes replace conditioning systems. SkyBlade Fans are utilized in high ceiling facilities, open office spaces, warehouses, places of worship, gymnasiums, auto dealerships and more.